Explanation: The prominent ridge of emission featured in this sharp, colourful skyscape is catalogued as IC 5067. Part of a larger emission nebula with a distinctive shape, popularly called The Pelican Nebula, the ridge spans about 10 light-years following the curve of the cosmic pelican's head and neck. This false-colour view also translates the pervasive glow of narrow emission lines from atoms in the nebula to a colour palette made popular in Hubble Space Telescope images of star forming regions. Fantastic, dark shapes inhabiting the 1/2 degree wide field are clouds of cool gas and dust sculpted by the winds and radiation from hot, massive stars. Close-ups of some of the sculpted clouds show clear signs of newly forming stars. 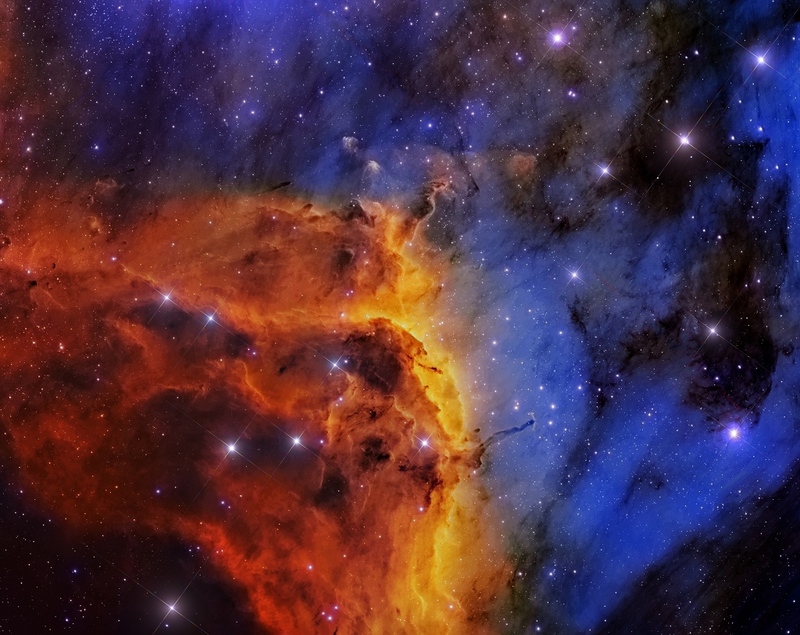 The Pelican Nebula, itself catalogued as IC 5070, is about 2,000 light-years away. To find it, look northeast of bright star Deneb in the high flying constellation Cygnus.